You Need A Budget YNAB 4.1 - Is It Worth It? You Need A Budget YNAB 4.1 Update – Is it Worth It? You Need A Budget (YNAB) rolled out a big upgrade to their budget tracking program recently. I’m going to take it apart in this post to help you decide if the upgrade is worth it (for existing users) or to see if the overall program is a good fit for people who are not already using it. I’ll start off by telling you that I am a huge fan of YNAB. It helps me, my wife and my children stay accountable, stay in control and most important, stay within our respective budgets. I can honestly say that it’s been a game changer for us. But I don’t think that YNAB is the only way to go. That you do track your spending every single month. That you use the information to make smart decisions. I love YNAB because it’s really simple and actually fun to use. As a result, we use it. (If I find budgeting fun, does that prove I am a nerd?) Because it’s so easy, everyone in my family keeps their information up-to-date. Most importantly, since we’ve been using it, none of my college age kids have ever asked me for more money. They stay within their budgets. This program has taught us all to be financially responsible. That is an amazing benefit that I just can’t put a price tag on. And it’s great piece of mind for my wife and me. But, there was one major flaw in YNAB 3 that they addressed. And there were many other opportunities that they took advantage of when they rolled out 4.1. I’ll explain those in a minute. First, let’s revisit the purpose of the program in order to understand how critical the upgrade is. For a complete discussion of the program, I recommend you read my YNAB review. But in case you don’t feel like clicking over there, I’ll summarize. YNAB is a program that allows you to set up a budget and then track your spending. It shows you if you are on target or not. If you aren’t, it shows you how to get back on track. In short, it allows you to plan your budget rather than react to your spending. That’s big. The power of the program is that it shows you where your spending is solid and where you may need to make some changes. Most programs are only helpful after the fact – they tell you after you’ve blown it. YNAB helps you avoid problems before they happen. Since the program shows you where you spent more than you budgeted, it allows you to make corrections before you create any real problems for yourself. What the program will not do is allow you to ignore a problem. That’s why I love it. YNAB helps you set aside money for larger, infrequent bills like car insurance, tuition or whatever. It actually creates a fund for you so that by the time the bill is due, you’ll have the money. No more scrambling. Nice. In short, the program shows you what to do NOW so you’ll be ready for whatever comes tomorrow and the day after that. How would you feel if you knew that you had money set aside for all your current and future bills – and even have an emergency fund set up? Pretty good….am I right? Thought so. That’s why I’m a fan. The site reports that after one month, YNABERS see a median net worth increase of $200. And after nine months, the median net worth goes up by $3300. That’s a spicy meat ball if you ask me. How do they do it? As I said, YNAB is a living, breathing friend. If you overspend, the program helps you find a solution to quickly get back on track and save so you can reach your goals. 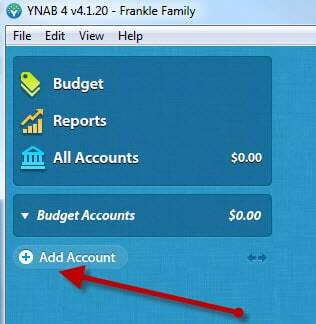 (If you are a current user, you can easily import your old budget from YNAB 3.0. But for purposes of this review, I’m going to set up a new one.) This screen displays a couple of new great features. You can sync your data for free using Drop Box which is super cool if you collaborate with a spouse, child or parent. This is a brand new feature and I would have to say it’s “neato”. 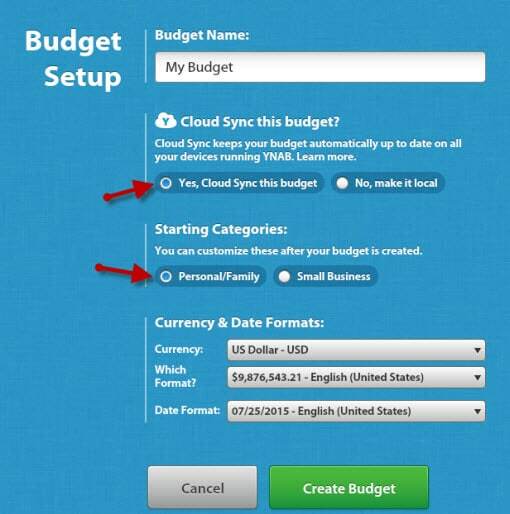 Rather than having to save and send files, the cloud synch keeps your data updated automatically for all your users. I’ll say it again. I am a huge proponent of getting everyone in the family to use a budgeting program and to work together. The cloud sync using Drop Box is automatic, instantaneous and exactly what the doctor ordered. And this has the added benefit of providing an all-important backup as well. The second new feature You Need a Budget rolled out is the ability to use the software for small business. YNAB touts the software as being a better package than QuickBooks for the right business user. They are very clear that YNAB for small business is a good fit for a simple business and not one that has inventory and/or that uses the accrual system. It’s geared for small business owners who provide a service and get paid for those services. Period. Well…I don’t know about YNAB for business yet. I haven’t tested it. I will review this as a business application shortly. For now, let’s assume you are going to use this for your family. YNAB can now be used with any currency in the world. So if you happen to be overseas, you can still use the package. Thoughtful. If you want to take your existing YNAB 3.0 budget and upload to the 4.1 package, you simply select File/Open at the opening screen, pull up your data from 3.0 and you’re good to go. For our purposes, let’s assume that you are new to YNAB. After you download the program, the next step is to select “Add Account”. The “Create a New Account” screen will ask you for the name, current balance, date of current balance and the type of account. This allows you to start using YNAB at any time even though you may have opened a bank account sometime in the past. I went to my bank website and downloaded the data. As soon as I clicked on the file, You Need a Budget popped open and asked me if I wanted to upload it. I love it when someone does all the work for me. Kickin’ it. This preview screen shows me all the transactions that I am about to import. I select IMPORT and the magic happens. The data flows into my YNAB program. My next step (and this is very important) is to select a category for each payment. I can’t overemphasize how important it is to select the correct category for each transaction. How you categorize your payments will drive the reports you get and thereby the spending decisions you make. The beauty of YNAB is that they have a predefined list of categories that should handle 90% of your transactions. If a category isn’t already there, you can easily set up a new one. It’s super important to reconcile your bank statement and your YNAB data. This insures that you’ve accounted for everything. YNAB 3 did not offer reconciliation and that was a problem. Thankfully, 4.1 solves that. 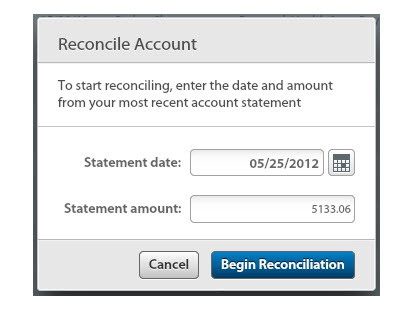 To reconcile your accounts, simple select the “Reconcile Account” button on the bottom right of the register. This will bring up the following screen and the program walks you through a simple process of reconciling your accounts. I did this and it was much easier than the QuickBooks process and much faster. I also read many of the comments on the YNAB site and I didn’t see one negative remark. Like me, the other commenters reported that reconciling was super easy and fast. 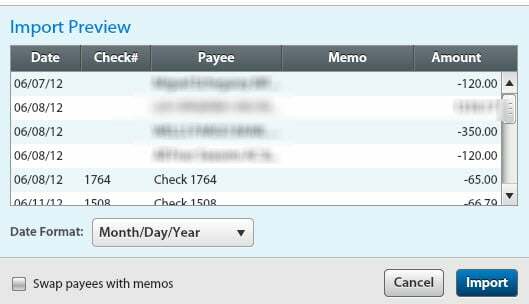 If you don’t reconcile your bank statement, you may think this feature isn’t so important. I would suggest you turn this around. Consider all you have to gain by reconciling your bank statement and then realize how incredibly valuable this tool is because it will help you get it done so easily. While you probably won’t need it, the website has a help article on reconciliation that will answer any questions you might have. They provide tutorials, white papers, screen shots and even free classes on almost every facet of the program. These guys are seriously on a mission to help you stop living paycheck to paycheck, get out of debt and save money faster. Auto Recovery – If you make a mistake you can easily call up a previous version of your data. Unified Account view to see where all the money is going. Auto Save so you never have to worry about losing your work. With one license, you can install YNAB on all your computers. These upgrades are really nice but to tell you the truth, “they had me at reconciliation and cloud sync”. When you save your data, you can either save it to the cloud using Dropbox or your own hard drive. I wish you could do both. I am a backup freak because data is so valuable. I am a big believer in multiple backups and this is somewhat cumbersome. The work-around is to do a “Save version” to the cloud and then change your preferences to “local backup”. Then, save a version to your hard drive. To me, this is silly and makes no sense. While I don’t consider this a deal breaker I do consider it a pain in the arse. I contacted YNAB and asked them to remedy this. I’ll let you know what they come up with. If you are new You Need a Budget, the program will set you back $60. If you are upgrading, it will cost you $40. If you bought the earlier version after 12/26/11 you can upgrade for free. YNAB gives you a 34 day trial and a full 30-day money back guarantee too. No risk to you. I like. I know this program works because I’ve been using it for several years. I’ve recommended it to clients and they all report back with very glowing reports. This program is easy and fun unlike Quicken and QuickBooks. As a result, you’ll really use it and then reap the benefits. It might be for small business owners, but I’m not sure yet. Hold off for the time being. If you aren’t in debt, save plenty of money, are clear about how your finances work and reconcile your bank account, you don’t need this. Whatever you are doing is working so keep at it. And if you are looking for a program that tracks investments, YNAB is not the application you want. If you really want to make a positive change in your financial life, get this program and start using it. The program will help you get on track and stay there. 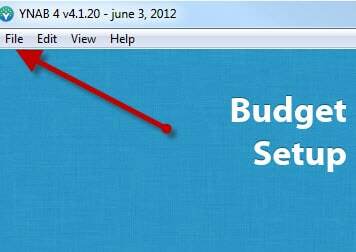 It’s the strongest budgeting software out there. The support is fantastic and the price is ridiculously low when you think about all the benefits. You can use it for Mac or PC and you can install it on as many computers as you like in your household. As I said, YNAB gives you a 34 day trial and a full 30-day money back guarantee. What exactly have you got to lose by giving it a try? It’s true that when people buy the program or upgrade from my site I get a few bucks but that’s not why I am a raving fan. I could endorse any product I want and get paid. Believe me, there are many other programs that want my endorsement and are willing to pay me much more than I get from a You Need a Budget sale. I endorse this product because it works for me, my family and people I’ve recommended it to. It is the most inexpensive way I know to transform your financial life. Do yourself a favor and upgrade if you are a current user or buy the program now if you are not currently taking advantage of YNAB. As for the backup problem, can’t you just make a backup of the files in your local dropbox folder? Yes. YNAB allows for that. It’s just not as easy to do as I’d like. Also, you can either do a backup on Dropbox or do one on your hard drive – not both. I would prefer it if I could do both. You’re right, it would be nice to have it done for you automatically. I recently subscribed to your blog mostly because you love the YNAB product much like I do. I have been a YNABer for almost 3 years now and recently upgraded to YNAB 4. Is there any way I can still get your e-book if I provide you with the receipt? I would love to read it. I’m going to email out to my family and friends and endorse YNAB much like you did here…and I’ll attach the link to this article.